In wanting to speak for the “99 percent,” Occupy Wall Street–and its allied campaigns around the country–has defined a constituency and a target. The argument is that the economy and government work for only a small percentage of Americans, and that things could be different. To succeed movement campaigns identify a base and a target, framing their core constituency as worthy–and preferably numerous. The target should be identifiable too. Deciding whom to blame is a key task of all politics, including movement politics. 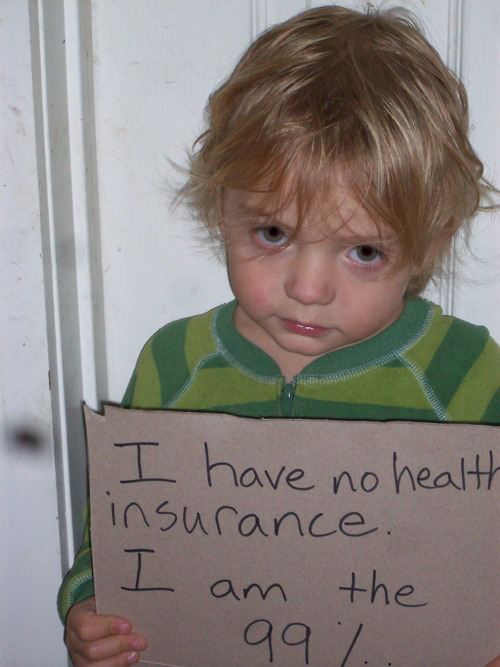 To embody the 99 percent, activists set up a website, “we are the 99 percent,” comprised of simple pictures and stories. Mostly, it’s about hardship. People who post tell about owing money for a house or an education, needing health insurance, unemployment and underemployment. Although critics charge that Occupy doesn’t have a clear program, it’s very easy to look at these stories and see a set of policies that respond rather directly to their concerns; government can spend money to produce employment, access to education, offer health care, and even aid in personal debt relief. At this posting, there are 146 pages of stories. You may be able to dismiss one or another as telling stories of foolishness or selfishness, but the cumulative impact of story after story is powerful. Together, the individual stories push blame up to those who are wealthy and powerful. The site invites contributions, but some people who supported Occupy saw themselves as privileged. “We stand with the 99 percent” tells stories of people who are not suffering person ally, but believe that it’s good and right for the United States to find a way to provide work and health care for everyone. But opponents of the Occupy campaign, understandably, don’t want to let this pattern of blame stand unchallenged. To counter Occupy rhetoric, conservatives started “We are the 53 percent,” which also invites individual contributions. Fifty-three percent refers to the Americans who currently earn enough to pay federal income taxes–in addition to the payroll taxes that everyone pays, plus excise and local government taxes. This is an attempt to push blame down to the less fortunate, rather than upward. Using the same format and colors as the 99 percent site, there are now 30 pages of 53 percent stories. I read two basic types: people who are doing well, although they can trace humble origins, because they–or someone in their family–worked very hard; and people who are doing very badly, lacking jobs and/or health insurance. Both take responsibility for their circumstances and hate whining. 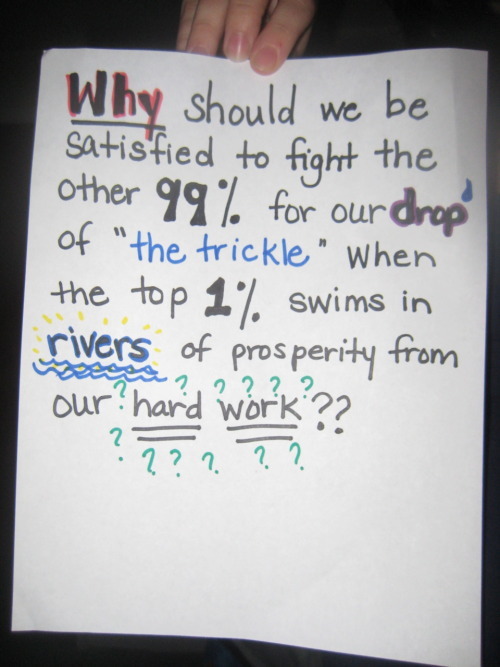 They think those who claim to be the 99 percent are lazy and have an undue sense of entitlement. 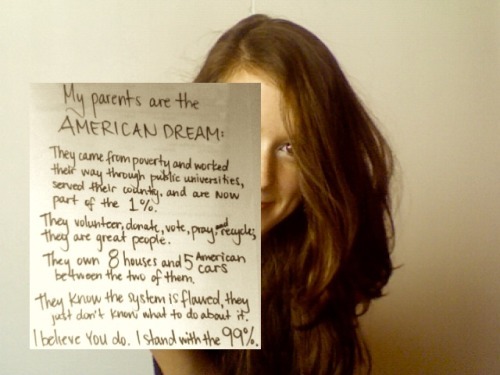 So a group of Occupy campaigners, noting that many of the self-proclaimed 53 percenters don’t really earn enough to pay taxes, started “Actually, you’re the 47 percent,” which reprints the pictures from the 53 percent site, along with snarky and dismissive comments (3 pages at this moment). An entire rhetorical battle about blame is playing out on these sites, offering plenty of stories to make any argument you want to make. The stories strengthen the resolve of the committed, but more important, is the reaction of a broader public as the crystallized arguments hit mainstream politics. The early returns are in recent polls, and the Occupiers are winning. Fifty-four percent of Americans support the Occupy Wall Street campaign, according to Time magazine, about twice the percentage who support the Tea Party. A slightly more recent National Journal poll shows Occupy with 59 percent support. Don’t expect opponents to give up, however. Look for new campaigns to discredit the Occupiers as lazy, violent, privileged, ignorant–or so many other attempts. Activists for any cause wan to demonstrate their worthiness, unity, numbers, and commitment (WUNC, according to Charles Tilly). Look for their opponents to try to dismantle each of those claims. This entry was posted in Uncategorized and tagged 1 percent, 53 percent, 99 percent, Charles Tilly, countermovements, Occupy Wall Street, rhetoric. Bookmark the permalink. Is it liberal elitism to point out how horrible the grammar of 53% of us seems to be? Most days, I think about bad grammar everywhere as a reflection of disinvestment in education in America. Are the 1 percent more competent? “Things could be different.” I guess that is safe since they always are! Why would such a cosmic and banal assertion appear? If a finite essay is to accomplish anything in a contested area of social evaluation, the concepts and evidence at issue must be defined with care and focus. My take is a little different than yours. I think most people view most of the world around them as constant and intractable. Part of an activist’s job is to convince people that this isn’t so. I’m sorry you find this banal.